What’s not to love about fresh vegetables in the summer time? The taste is great, the color is vibrant, and they add that extra zest to your meal. Stocking up on these nutritious seasonal treats can be hard if you don’t eat them before they rot, but what if you freeze them? 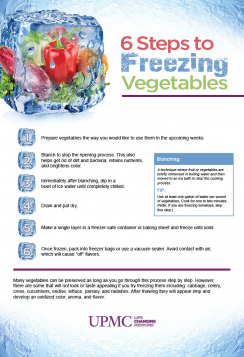 Although some vegetables will not survive thawing most do retain their nutrients and stay fresh after freezing. A very important part of keeping your vegetables fresh and healthy when freezing them is to follow the proper steps. Make sure to freeze them when they are at their peak ripeness so you can enjoy them for months to come. Prepare the produce. For example, cut up your cauliflower that you would like to use in a pasta salad in the upcoming weeks. Immediately after blanching, briefly dip the vegetables in a bowl of ice water until they are completely chilled. Take out a freezer-safe container or baking sheet. Make a single layer of vegetables and freeze them until solid. Once frozen, pack them into freezer bags or use a vacuum sealer. You do not want them to come in contact with air. This will cause “off” flavors to develop by the time you defrost them. Many vegetables can be preserved as long as you go through this process step by step. However, there are some that will not look or taste appealing if you try freezing them including: cabbage, celery, cress, cucumbers, endive, lettuce, parsley, and radishes. After thawing they will appear limp and develop an oxidized color, aroma, and flavor. Irish potatoes are also not an ideal vegetable to freeze when they are baked or boiled. After thawing they become soft, crumbly, and waterlogged. Other types of potatoes freeze much better. If you want to have an endless supply of fresh vegetables even after the summer farmer markets close, plus save money by buying produce when it’s the least expensive, follow these six steps to effectively freeze them. This will let you enjoy your favorites even after they are out of season.